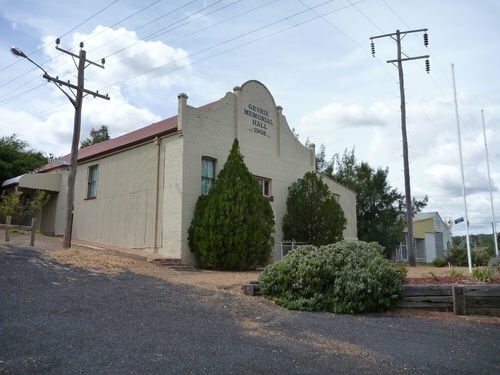 Geurie Memorial Hall was erected to commemorate those from the district who served in World War One. The hall was originally erected in 1908 with the building purchased and alterations and additions made before being renamed the Memorial Hall in 1933. A meeting of the Geurie War Memorial Committee was held at Geurie on Friday night last, when proposals were considered for the purchase of a suitable building. Several proposals were submitted, but those present finally decided upon the purchase of Miss Payne's building. The building, which is to be altered later to suit requirements, is to be purchased outright and the purchase money paid in full. The motion for the purchase of the building was submitted by Messrs Geo. Sears and S. Sicard. On the motion of Messrs Geo. Sears and A. Stewart, it was resolved that the secretary be instructed to call tenders immediately for alterations and additions to the newly purchased will be known as the memorial hall. Wellington Times (NSW), 20 February 1933. In beautiful spring weather, bathed in glorious sunshine, the simple, but impressive ceremony of unveiling the tablet, and opening of the Geurie Memorial Hall was carried out yesterday afternoon. The hall was erected to the memory of the brave lads of Geurie and district who heard the call to arms, and hesitated not in the hour of danger, when the Empire was calling for assistance to resist the mailed fist of Germany, which country was endeavouring to crush all the smaller nations of the world. Wellington Times (NSW), 31 August 1933.